Source: Cooper University Hospital, Camden, N.J. This dish makes a great side to traditional entrées. 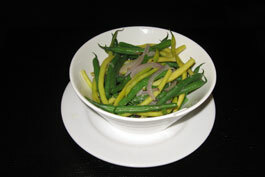 Green beans and yellow wax beans are tossed with garlic and red onion for a healthy and savory side dish. Heat sauté pan. Heat olive oil. Add onion and sauté until soft, about 3 minutes. Add green and yellow beans and toss until hot. Add garlic and sauté for 1 to 2 minutes. Add water, salt and pepper to taste. Cover and remove from heat until ready to serve.